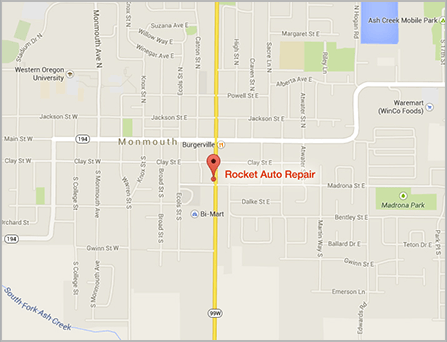 At Rocket Auto Repair, we are your local Monmouth, OR automotive service experts. We are a family owned and operated shop, so you could say that car service runs in our family. Whether you need an oil change or exhaust work, our team will take care of all your auto repair and maintenance needs. We’ll keep you informed throughout the service and help you prioritize the work that is done based on your vehicle’s specific needs. If you live in Monmouth, auto repair shops are located on almost every major road – but can any of them say they are qualified to use state-of-the-art diagnostics? We sure can. Our mechanics are ASE Certified Master Technicians with the training to service almost all makes and models, including asian and domestic. In fact, the quality of our service allows us to perform maintenance on your vehicle without voiding your existing warranty, which helps you save money. We also back every service with a leading 24 month/24,000 mile warranty, so you can be as confident in our work as we are. We know that bringing your car, truck, or SUV in for service is not at the top of your list of things you would like to do in your spare time. That is why our staff goes the extra mile to make sure you have a great experience while you are at our auto repair shop. We proudly offer a pick up and drop off service as needed so that you do not have to wait while we service your vehicle. If you cannot make it to our shop during business hours, we also provide an after hours drop off service for your convenience. Make an appointment today and experience the Rocket Auto Repair difference! Did you have a great experience at Rocket Auto Repair? We would love to hear your feedback! You might even see your review displayed here along with reviews from our other loyal customers. We'd like to hear your story!